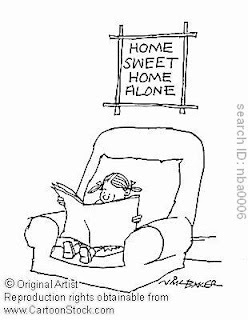 on her own turf: Home Sweet Home Alone?! Not that I dont have those friends anymore, but they dont live with me now. Its been almost a year since I have been staying alone at my new place (Technically a few months as my sister was always around till about two months back! ), and I somehow have mixed feelings about the whole idea. Initially the idea was definitely exciting! Your own space, Wow! You get all the privacy in the world, You can call your friends and family over (thats the best part), You can play whatever music you want.... blah blah..
Later on as the months passed, I had too many things to think about : electricity bills,a nosy landlord, random noises in the middle of the night (ok, maybe I was hallucinating) cleaning and cooking (this one is the worst). The past few months have made me relaize that though I am an independent person and like my own space, I cannot be alone. I need someone around to talk to,to come back home to..(someone pleasant of course) !!! I keep asking myself - Is this normal? How could I be so immature? But I am sure most of you who have stayed alone would have felt the same way. It can get quite boring after a while, unless you are a person wedded to your work and thats all you can think of even while you are at home. No salsa classes nor gym will help you handle the solitude, its clearly something you need to accept and get used to I realize. On a positive note, I must say I did manage to do a lot of reading, a bit of cooking ;) and surely a whole lot of online research on most things living and non living (hehehe) in the past few months! Phew! ..... If any of that counts for healthy living...:)ummmmm.. I think it sure does! so Yayy! !